To use your Azure Sphere devices with the IoT, you can set up an Azure IoT Hub to work with your Azure Sphere tenant. 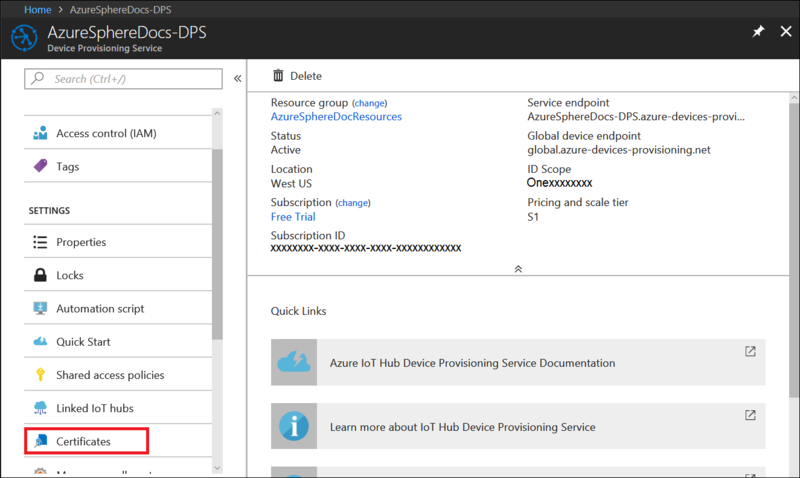 After you have completed the tasks in this section, any device that is claimed by your Azure Sphere tenant will be automatically enrolled in your IoT hub when it first comes online and connects to the Device Provisioning Service (DPS). Therefore, you only need to complete these steps once. Create an Azure IoT Hub and DPS in your Azure subscription. 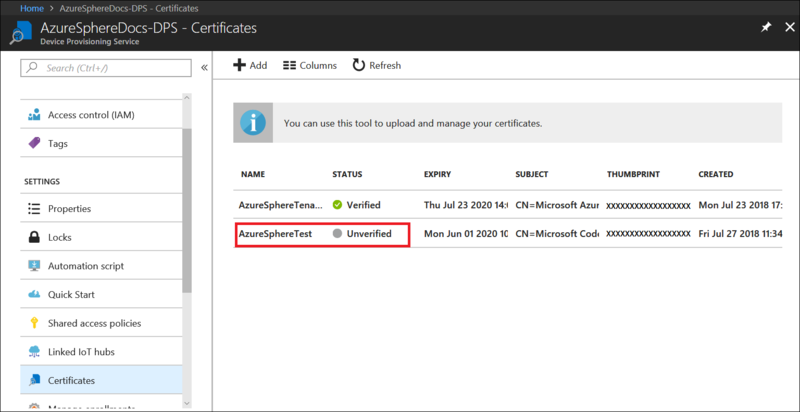 Download the authentication CA certificate for your Azure Sphere tenant from the Azure Sphere Security Service. Upload the CA certificate to DPS to tell it that you own all devices whose certificates are signed by this CA. In return, the DPS presents a challenge code. Generate and download a validation certificate from the Azure Sphere Security Service, which signs the challenge code. Upload the validation certificate to prove to DPS that you own the CA. Create a device enrollment group, which will enroll any newly claimed Azure Sphere device whose certificate is signed by the validated tenant CA. Although you can create an Azure subscription for no charge, the sign-up process requires you to enter a credit card number. Azure provides several levels of subscription service. By default, the Standard Tier, which requires a monthly service charge, is selected when you create an IoT hub. To avoid a monthly charge, select the Free tier. The Free tier includes the services required to use your device with an IoT hub, including the Device Twin. If you choose to test an Azure IoT-based application that uses the Device Provisioning Service (DPS), be aware that DPS charges $0.10 per 1000 transactions (ten U.S. cents per one thousand transactions). We expect that the free credit that applies to many new subscriptions will cover any DPS charges, but we recommend that you check the details of your subscription agreement. Create an Azure IoT Hub and DPS and link them. Do not clean up the resources created in that Quickstart. Open an Azure Sphere Developer Command Prompt, which is available in the Start menu under Azure Sphere. The output file must have the .cer extension. Open the Azure portal and navigate to the DPS you created in Step 1. Open Certificates from the menu. You might have to scroll down to find it. Click Add to add a new certificate and enter a friendly display name for your certificate. Browse to the .cer file you downloaded in Step 2. Click Upload. After you are notified that the certificate uploaded successfully, click Save. The Certificate Explorer list shows your certificates. Note that the STATUS of the certificate you just created is Unverified. Click on this certificate. In Certificate Details, click Generate Verification Code. The DPS creates a Verification Code that you can use to validate the certificate ownership. Copy the code to your clipboard for use in the next step. Return to the Azure Sphere Developer Command Prompt. Download a validation certificate that proves that you own the tenant CA certificate. The Replace code in the command with the verification code from the previous step. The Azure Sphere Security Service signs the validation certificate with the verification code to prove to DPS that you own the CA. 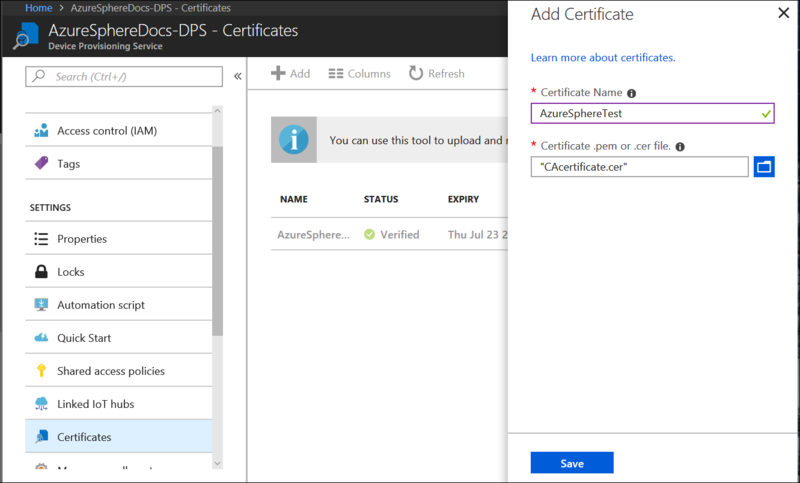 Return to the Azure Portal to upload the validation certificate to DPS. In Certificate Details on the Azure portal, use the File Explorer icon next to the Verification Certificate .pem or .cer file field to upload the signed verification certificate. When the certificate is successfully uploaded, click Verify. The STATUS of your certificate changes to Verified in the Certificate Explorer list. Click Refresh if it does not update automatically. In the Azure portal, select Manage enrollments and then click Add enrollment group. In the Add Enrollment Group pane, create a name for your enrollment group, select CA Certificate as the Certificate type, and select the certificate that you validated in the previous step. Click Save. On successful creation of your enrollment group, you should see the group name appear under the Enrollment Groups tab. 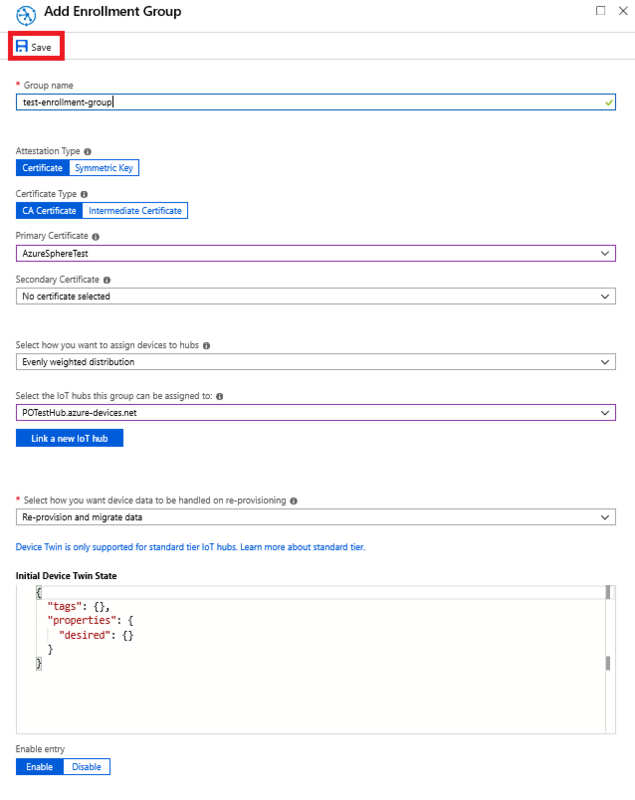 After you complete these steps, any device that is claimed into your Azure Sphere tenant will be automatically enrolled in your IoT hub when it first connects to your DPS. You can now run the Azure IoT Tutorial, the Azure IoT sample, or build your own applications that use your IoT hub.